I love what I do and I love the people I do it for. Massage does everyone a world of good! 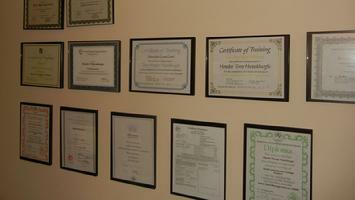 AT RIGHT: Some of the certificates and diplomas awarded me for advanced study in massage techniques over 20 years of doing what I love most. When not delivering a massage, I'm checking out new ideas in my field and polishing and updating my time-tested techniques in courses and seminars...and, always, daydreaming about how to serve you even better. I donate $1 per massage to Breast Cancer Awarenes...but you make the real donation, so thank you!